Organizers: National Film Archive of India, Film Heritage Foundation and FIAF, in association with The Film Foundation’s World Cinema Project, George Eastman Museum & L’Immagine Ritrovata. 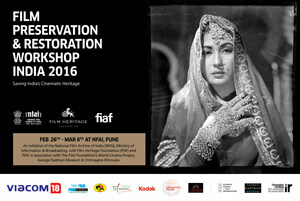 Following the success of the Film Restoration and Preservation School in Mumbai in February 2015, the Film Heritage Foundation and FIAF decided to join forces with the National Film Archive of India to offer a 10-day training programme to take place in Pune at the end of February 2016. The Workshop was officially announced by the government of India at a high-profile press conference during the International Film Festival of India in Goa on 22 November 2015. The course is being specially customized by the FIAF Technical Commission for Indian requirements and conditions, and will be certified by FIAF. 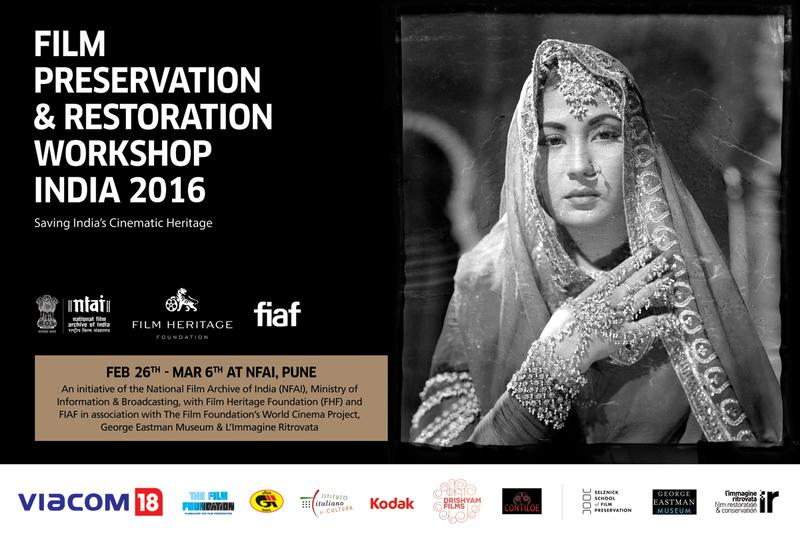 This is a ten-day advanced course with a focus on practical training in current film preservation and restoration techniques and archival practices conducted by leading archivists and restorers from preeminent international institutions. The flyer for this event can be downloaded HERE. The Workshop catalogue can be downoaded HERE. The full Workshop schedule can be downloaded HERE. After carefully examining all the applications for scholarships, FIAF awarded scholarships for the workshop to five students from Indian and Bangladesh: Mr. Md. Rashedul Alam Gazi; Ms. Shruti Narayanswamy; Mr. Sachin Sharma; Ms. Vinita Negi; Ms. Ritika Popli.